Preheat oven to 180°C or 350°F fan forced. Line a standard size 12 muffin silcone tray with ham slices and put on a baking tray for easy transfer to oven - if you are using a metal tin, lightly grease with oil or butter of choice before putting ham in. Add whole eggs, egg whites, quark, onion powder, garlic powder, oregano, black pepper and stock concentrate to mixer bowl. Beat for 30 sec/speed 5. Add mushrooms and baby spinach to mixture and combine for 10 sec/speed 2. /4 fill each ham case with quiche mixture. 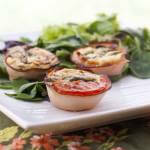 Garnish with tomato slices and cheese. Bake in oven for 45 min or until set. Let quiches sit for 10 min before serving. Serve with an avocado salad to boost the good fats in this meal. If you aren't on a weight-loss journey, you can use all whole eggs - I have seen various LCHF sources which suggest that while attempting to lose weight, you should keep your fat levels to a reasonable level and boost your protein - I have designed this recipe with this in mind. Quark is a fantastic high fat, low carb cottage cheese - you can get it from most supermarkets in the specialty cheese section. First time ever trying quark for me. 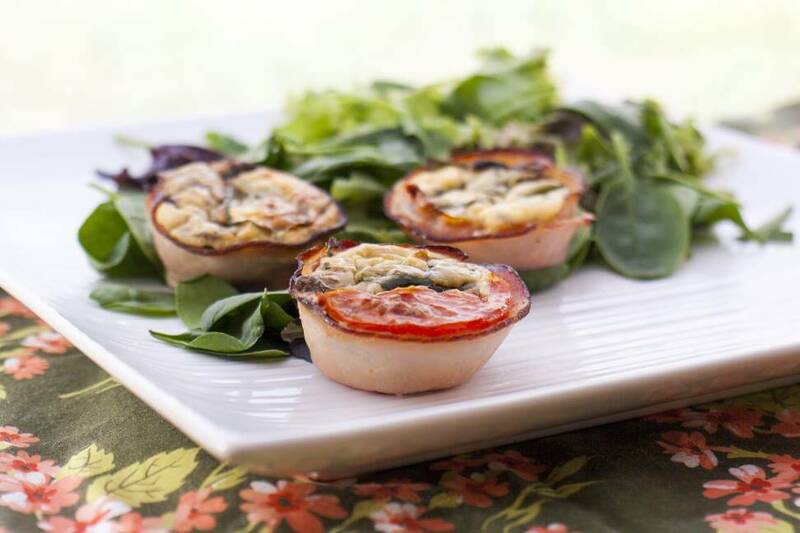 These quiches are delicious. Another winner. Thanks Nikalene! BTW quark is easy and inexpensive to make! It can cost quite a lot at the supermarket and the quality is variable. All you need is buttermilk and whole milk. I’ve posted a recipe in the Thermomix Recipe Community (but you can also make it without a TM). I made these with ricotta, whole egs and crumbled feta on top. They’re were absolutely delish!